1) Easy Access to all of our main services, Website Packages, Monthly Maintenance, eCommerce, Emergency Jobs and Joomla Upgrades are all accessible from the main page. We wanted to make sure that you didn’t have to click through a bunch of links or menus in order to get to the heart of what we do. 2) One of our most visited sections is Tutorials. From Email and Hosting, Joomla Websites, Social Media and Ecommerce, you can now easily access our library of over 100 tutorials to help you learn the ins and outs of how to use and market your website. 3) Need to reach us? You don’t have to hunt for our contact information, it’s all right here on our home page. 4) Need support? Right here from the home page you can reach our live support agents and open up a trouble ticket. 5) We have really had the chance to work with a lot of cool companies and we’re proud to show them off here. 6) There is always something new going on when it comes to the web and we keep you in the loop by putting a link to our latest and greatest tutorials right here on the home page. The rest of the site is full of the same easy to find features as the home page. 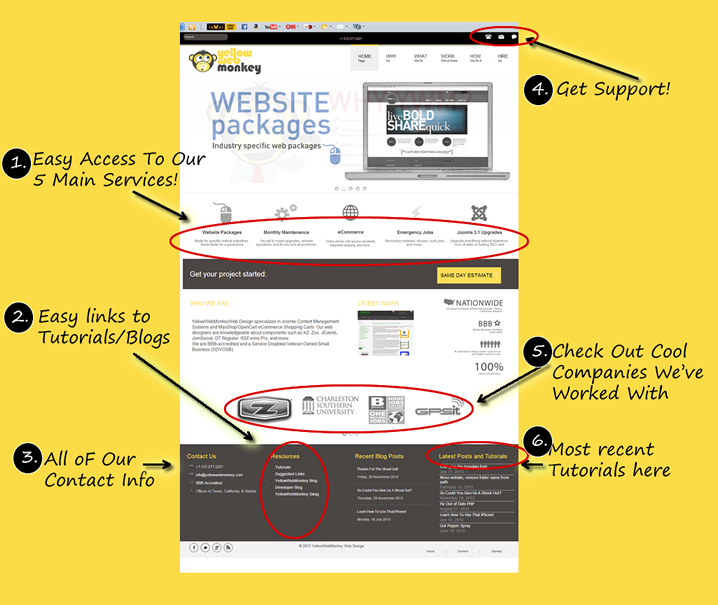 We hope you'll browse through and check out the new re-vamped YellowWebMonkey Design website. We hope you like it as much as we do and that we’ve made it easier for you to find what you’re looking for. Nicole started in web design when she saw a really ugly website that someone challenged her to design better. 15 years later she still loves working with anything that has to do with design. From websites to logos to print pieces she enjoys the challenge of bringing ideas to life. Her favorite hobby is cooking and creating gourmet meals for her husband and children.